Tract 3: 8.90/ac with immediate access to I-26 and visibility available for combined or separate purchase. Exit 13, Forks of Ivy, is the first I-26 exit in Buncombe county as drivers head south from Johnson City and surrounding towns. It is 3 miles from Mars Hill University and 16 miles from Asheville. Excellent opportunity for a gas station, hotel, student housing, multi-family, and general commercial development. Three parcels totaling 14.76/ac +/- are available together or separately. 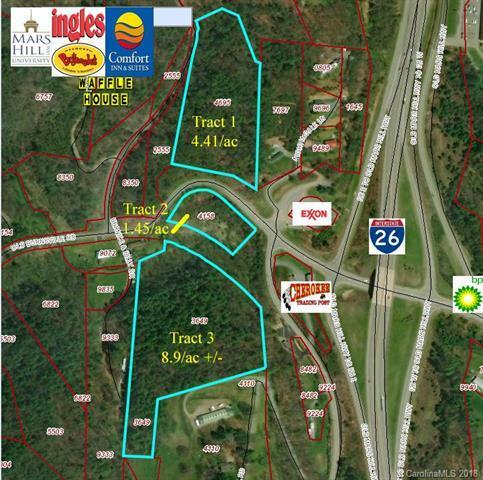 Tract 1: 4.41/ac ($695,000) is located at the NWC of I-26 and Exit 13. Tract 2: 1.45/ac ($399,000) and Tract 3: 8.90/ac ($850,000) are located at the SWC or I-26 and Exit 13. These parcels can be purchased individually.